Since 1963, February has been celebrated as American Heart Month with hopes to urge Americans to join the battle against heart disease. Being the number 1 leading cause of death (killing approximately 630,000 Americans each year), we decided to join the fight! This month, we’re promoting heart health awareness and sharing some life-changing tips for you and your loved ones. The American Heart Association recommends that adults get at least 30 minutes of exercise a day. Why not grab a friend or neighbour, and join a class at your local community center together? From yoga to water aerobics, there’s a class for people of all ages, suitable for all different skill levels. However, if classes don’t sound appealing to you, consider getting your 30 minutes of exercise by simply embarking on a quick walk after meals! Exercising will not only help to maintain your weight, but it also assists in decreasing your risk of heart disease! Smoking can cause serious health problems for anyone, however, the burden is particularly greater for older adults. While it may enhance your day temporarily, as we all know very well, there are countless long-term health problems that consequently follow. 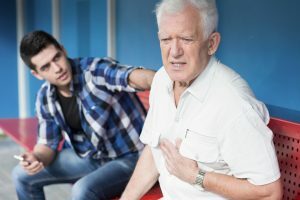 As a senior’s health is already more vulnerable to health conditions such as: cancer development, heart disease, heart attacks and pneumonia, smoking only continues to increase risk. Quit as soon as possible! To no surprise, consumption of saturated fats, salt and foods containing cholesterol (ex: fatty meats) can increase your chance of cardiac conditions. Luckily, these health problems are completely preventable by making health conscious choices when eating. Start by incorporating more dark leafy greens, and fruits/vegetables with deep reds, yellows and oranges. Daily intake of these foods has been linked to assisting in lowering blood pressure, reducing the risk of heart disease and even decreasing risks of cancers, eye diseases and digestive issues! While certain age-related changes (ex: difficulty in chewing) can affect your choice in foods, we believe that it is possible to find foods that are suitable for you. We suggest trying healthy options like yogurt and berries because, not only are they packed full of nutritional value, they also require minimal chewing! Oh, and they’re delicious! In the spirit of heart health month, we hope these tips have helped or encouraged you or a loved one to adapt a healthier lifestyle! Finding the perfect balance in your life and maintaining healthy heart function is not easy, but will pay off! We can’t wait to hear the changes you made in your life this month! If you require more information or assistance on this transition, feel free to contact us at 925.271.9100.